Keyword Research That Get’s Results! So as my story goes, I basically have been at SEO for over 2 years now and only recently have I found any real success. The major breakthrough came in the form of how I did my keyword research. I’d read time and time again that keyword research is the first step, and if you mess it up, you are doomed to begin with. I always knew that I needed to find high search, low competition keywords with buyer intent, but it just was’t that easy! I’d spend hours and hours searching for good keywords, and find 1 if I was lucky. 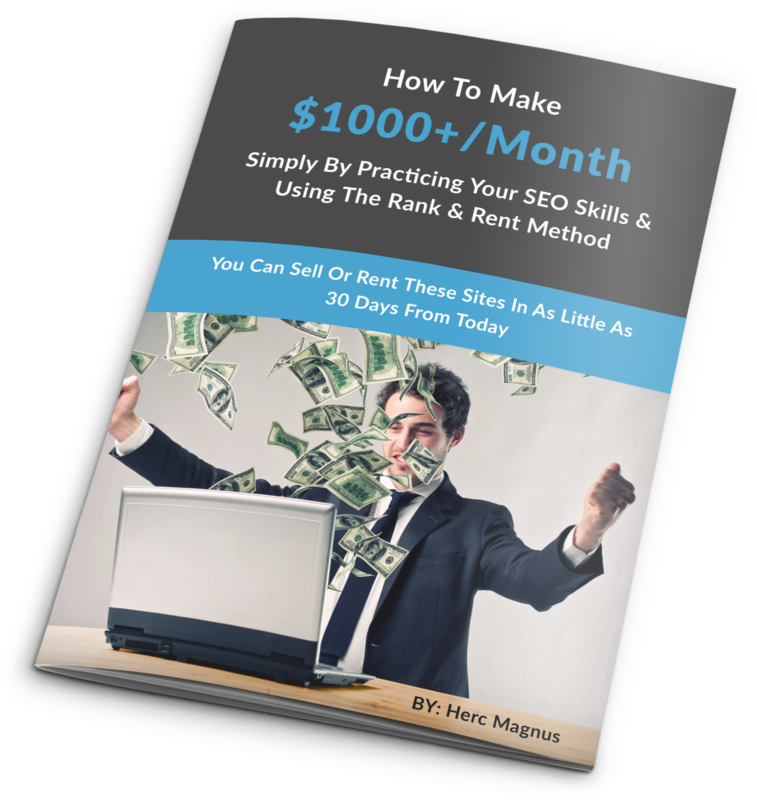 I can sit down for 30 minutes and find multiple keywords with over 10,000 searches per month, with domains available and competition that I know I can beat even without back links. On multiple occasions I’ve found keywords, registered an Exact Match Domain, built a blog and had a Page 1 ranking on Google all within one week. I’ve even done it 48 hours. So what happened? How did I go from a keyword research idiot to a savant overnight? Well the funny thing is that I had the proper keyword research tool all along, I just didn’t know how to use it properly. 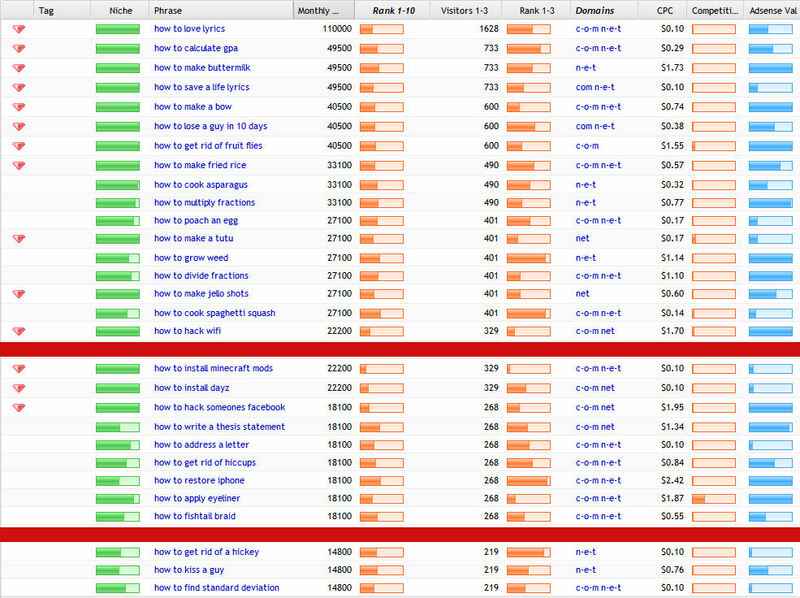 Yes you can do keyword research with the free Google Adwords Keyword Tool, but it’s going to take freaking forever! I’d rather spend a few bucks to save my time. Isn’t that one of the things money is for anyways? You spend time to get money, so it only makes sense that the reverse is also true. Spend money, and get back some time! The single most important SEO Tool I now own is my keyword research software Search Engine Cockpit. Ya, it’s a bit expensive, but it’s 100% worth the price in my mind! I also own Market Samurai, Micro Niche Finder, Traffic Travis and Keyword Canine, and where all of them have some sort of uniqueness, I feel that SE Cockpit has everything all the other majors do, plus a lot more. I’d want to get into a market like weight loss, so I’d open up SE Cockpit and I’d type in ‘weight loss’ to the Keyword Phrase Box. Then I’d use the Adwords Synonyms Suggest to grab more ideas related to weight loss so that I’d pull more keyword. But I found nothing. I’d switch niches from weight loss to acne and do the same thing and I’d find nothing. I am a huge fan of the forum community at Bring The Fresh by Mike Long and Kelly Felix, as people are so helpful in there. One post of a guy who was having great success was about his keyword research methods and he talked about ‘how people search‘. They search for things like “how to train a dog” and “how to get rid of acne”. Or if they are shopping they will search for “iphone review” and “iphone price” or “buy iphone” and “buy ipad”. And then after seeing that I made a strange connection with the way people search and the way that Google delivers results. People either repeat themselves a lot, or the Google Suggest tool leads people to search in very common strings. I mean people are always looking for how to do stuff and there’s literally unlimited “how to’s”. So I opened up SE Cockpit and I typed in “how to”. Then I use the Google Suggest Synonyms to fill in the blanks. I see those little diamonds start popping up all over the place in my search results, which mean that you have found an amazing keyword when search volume and competition are taken into place. Those are gems. I NEVER used to find gems and on my first search, I have like over 10 on one page! Unreal. 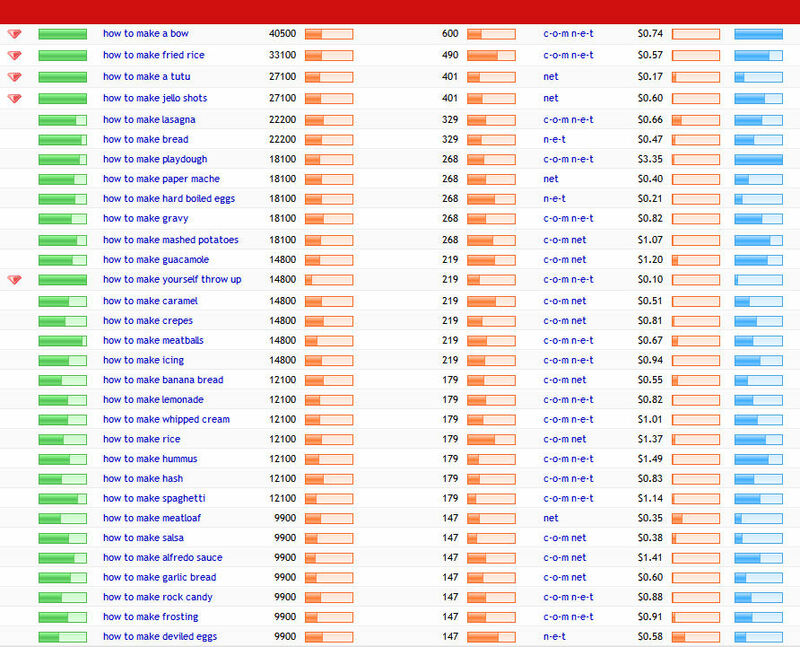 Then I set a filter to only show me keywords with a domain name available. It’s still looking really really good! So I set another filter to only show me Rank 1-10 Competition that has a value of under 40. And I’m absolutely gob-smacked! I have keywords with over 20,000 searches per month, low competition and domain names available. And not just a few of them. Tons of them!!! And that’s just from one search. Then I applied that same thinking logic of how people search vs how Google delivers results, and I see that I can take it a step farther using the Suggest Tool. I notice that a bunch of the keywords start with ‘how to make’. Which is one step further than just “how to”. So my next search is “how to make —” and I let Google fill in the rest. I set my filters to Domains Available and Rank 1-10 Competition less than 40. Again it’s another HOME RUN! Tons of keywords available with low competition and domain names available. And now at this point I’m really excited because I know the possibilities and this particular method of keyword research is simply ENDLESS!! And it doesn’t just have to be with the starter “How to”. Want to focus in on a particular item! Let’s say you are a big fan of Xbox! Just type in the word Xbox, and let Google Auto-Suggest do the rest. Well ever since I started doing keyword research this way, I haven’t looked back. It’s been an endless stream of keywords that I can find with thousands of searches per month! So it’s not just about having the right tool, it’s also about knowing how to use it! If you don’t already have SE Cockpit, then I highly suggest that you buy it and use it. It’s $97/month regular price, but below is a back door access where you can get your first month for only $37! So I suggest you get it now, or save this page so you can get it later! Yes I do make a commission if you purchase, so I hope that you don’t mind! I’ll continue to provide you with this amazing content as my way of saying thank you!